Your full-day Rome tour, in the company of a licensed guide and driver, will immerse you in Rome’s deep history, from the glories of the ancient world to the glory of the Baroque city. From its birth as the core of the Roman Empire to its development as the heart of Christianity, Rome has served as the backdrop for many significant cultural and historic events, and a simple glance can allow one to travel through the Eternal City’s centuries-old history. The Campidoglio, Capitoline Hill – derived from the Latin word caput, meaning head–is the most important of Rome’s seven hills and home to the world’s oldest public museum: the Capitoline Museums. From the hilltop terrace, one can admire the view of Ancient Rome’s true political, social and economic hub: the Roman Fora, untouched and in its original structure. Next you will see the Colosseum, the classical amphitheatre where thousands of Romans watched cruel fights between gladiators and wild animals for entertainment. The Markets of Trajan, built at the start of the second century, consisted of 150 individual shops for general trading: the first shopping mall in history! Some ancient architectural masterpieces serve as the foundation for newer buildings buildings, such as the 16th century palace that sits atop the Theatre of Marcellus. Public bathing was a daily ritual among the Romans, and the Baths of Caracalla, completed in 217, are the best preserved and most splendid of the city’s Imperial baths, while the impressive Circus Maximus was the first and largest sports arena in Rome, hosting chariot races, athletic contests, wild animal fights and mock sea battles. Your driver will bring you atop Aventine Hill, featured prominently in mythology, a secluded residential area with beautiful gardens and a sweeping view of the Eternal City. Next, our full-day Rome experience returns to the Centro Storico. 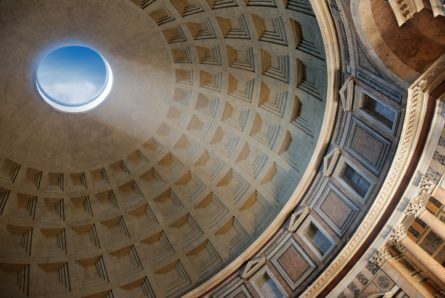 Continuing our morning theme of ancient Rome, visit the Pantheon then enjoy some of Rome’s most celebrated Baroque treasures: the Piazza Navona, the Spanish Steps and the Trevi Fountain.